Major J.P. Becher D.S.O. died of wounds on 1st January 1916. If you can add any further biographical or service information, please do so via the 'Comments' link below. This page was added by Website Administrator on 26/10/2011. On April 24, 1915 at Kemmel, when part of his trench was blown in, he organised the defence of the breach under heavy fire, and personally assisted in repairing the parapet and digging out buried men. On June 1, at Kemmel, when part of his trench was blown in by mines, shelling, and trench mortars, he displayed great gallantry and coolness in reorganising the defence. On July 30 and subsequent days, at Ypres, he displayed coolness, cheerfulness, and resource under trying circumstances when in temporary command of the battalion. Derby Daily Telegraph, 16th September 1915 – Citation for his D.S.O. The name Becher has been synonymous with Southwell for many years. John Pickard Becher, born in Southwell on 20th July 1880, was the son of John Henry Becher of Hill House, Southwell and Alice Mary Becher née Pickard, and great-grandson of Reverend John Thomas Becher, who was best known for his involvement in the Poor Law reforms of the early nineteenth century. John Becher was educated at Malvern Links and abroad. Upon leaving school he entered the law, serving his articles in Louth with Mr H.F.V. Falkener and subsequently joined the firm of Larken & Co in Newark. He was appointed Magistrates’ Clerk to the County Bench in 1909. In 1911 he married Gertrude Veronica Gale, the daughter of Henry Mark Gale and the Hon. Mary Emily née Strutt, third daughter of Edward, 1st Lord Belper. Gertrude’s mother had been widowed and she subsequently married Dr Henry Handford1. Senior Consulting Physician to the Nottingham General Hospital and a retired Major in the R.A.M.C. (T.F. ), living at Elmfield House, The Burgage, Southwell. The Bechers had three children: John Henry (1912); Mary Veronica (1913); and Margaret (1916 – born after John Becher’s death). Gertrude Gale had two half-brothers: Henry Basil Strutt Handford (1894) and Everard Francis Sale Handford (1895), both of whom were to die in the war – see below. 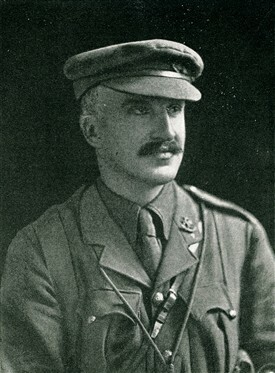 John Becher’s army career commenced on 1st November 1906, when he joined the Notts and Derby Territorials, and by the following June he was appointed Lieutenant; Captain on 9th May 1910; and Major whilst in the field in 1915. 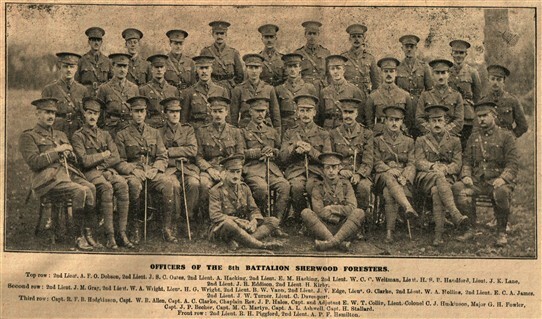 Captain Becher was the Commanding Officer of ‘H’ Company, 8th Battalion Sherwood Foresters, based in Southwell. He was well liked and respected by his men as he led from the front and it is claimed that he would never ask a man to do anything that he would not undertake himself. Major Becher’s exploits at the front are well documented in the battalion war diary. Tragedy at the Hohenzollern Redoubt. On the afternoon of October 12th, 1915, following a few days of recuperation at Fouquiers, the members of the 8th Battalion were ordered to collect fresh supplies and were marched via Vermelles, which was a seething mass of men and transport, to the front line in readiness to attack the German trenches. By lunchtime the following day the British artillery had opened up a barrage and by 1.00 p.m. greenish yellow smoke and chlorine gas was rolling towards the enemy on the breeze. By 3.00 p.m. they received orders to move forward and proceeded at a slow pace, as they were impeded by narrow trenches and a flood of wounded being carried back. The attack did not go to plan, as other units were held up by strong resistance, and finally came to a halt. The following day, 14th October, orders were received for a further attack that would involve A and D Companies. As the light was fading Major Becher was instructed to go out with a flashlight to help guide the attack. The men went forward in the darkness with fixed bayonets and no covering artillery to try and surprise the Germans. As they progressed they came across a number of the dead from the earlier fighting, and wounded men still trying to return to their trenches. At times the men realised that they were going off course and had to change direction. Once the Germans spotted the advance they retaliated with heavy fire, causing many casualties. It was during this period that Everard Handford was killed instantly by a bullet in the head and several others died with him or were wounded. Shortly afterwards Henry Handford, and others, were killed in a hail of rifle and machine-gun fire as they attempted to re-supply the front-line trenches in daylight. Whilst John Becher is buried in a military grave at Abbeville, there is a memorial to him in the Southwell Minster Yard. In addition there is a magnificent stained glass window in the Pilgrim’s Chapel dedicated to him. I am the great-grandson of Lance-Sergeant Thomas Martin MM a medic, who along with Sgt. Major Haywood, risked their lives under fire to recover Major Becher from no-mans' land, their commanding officer. My great-grandfather was awarded the Military Medal for his bravery, which remains within the family, as does a letter from Mrs Becher, edged in black, advising of his death, the arrangements for the memorial service and thanking my great grandfather for his bravery. Lance-Sergeant Thomas Martin survived the war and returned to the family home in Forest Road, Mansfield, his wife and 4 children (3 sons, 1 daughter), and his job with the LMS railway where he worked as an engine driver until his retirement. 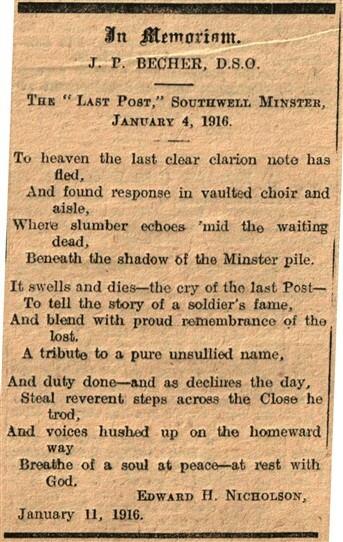 I have returned yesterday from Southwell, where my parish church choir was in residence for a week at Southwell Minster, culminating with a dedicated choral evensong yesterday afternoon to commemorate the eve of The Great War, in the presence of the Lord-Lieutenant of Nottinghamshire, Sir John Preece. Prayers were said in the peace chapel in memory of Major Becher and I lit a candle in the nave, in memory of Thomas Martin, John Becher and Mr Haywood. I have a letter written by his mother on the day he died to his brother, if you are interested.